In Law Suite Construction | Sarnia | Carosyl Home Additions Inc.
Knowing that your loved ones are living well and comfortably is very important. Sometimes this means the occasional phone call or dinner, but for others there is a need to keep them close but still ensure their independence. This is the case for many families with parents who are in their golden years. If you are looking for a way to have your parent(s) live with you while still giving them a place to call their own then an in law suite is the answer you are searching for. In law suites, also known as mother in law suites, are home additions which allow a person to live independently from the rest of the household. At minimum this means that the in law suite contains a bedroom and bathroom. Additionally, the area can have laundry facilities, living room, extra storage and a kitchen or kitchenette. Depending on your property and the current structure of your home, the in law suite can be a separate structure, a home addition, a garage apartment or a basement suite. In law suites are quite popular in Sarnia. This is not surprising as they add great resale value to a home. Even if helping a parent is not a concern, the suite can bring in extra income by housing a renter. For children who are almost ready to leave the nest, an independent living space can prepare them for the responsibilities of living on their own. Alternatively, it gives frequent guests a place to stay or a place to get away from the everyday. If you are looking for a trustworthy and reliable general contractor who can take on every part of the project from initial design and permit acquisition to the completed structure. 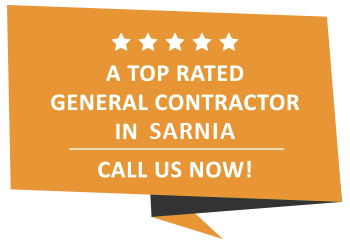 Give us a call or send us an email if you have any questions about the services we provide the people of Sarnia or for an initial consultation.